All students take three 4-credit courses, which are taught in English, one 4-credit Italian Language course, and an additional 2-credit Culture course implying a direct involvement in a variety of practical experiences. Language instruction is geared to meet the needs of beginning, intermediate, and advanced students. See below for course descriptions. This course is intended to give an understanding of Roman buildings through a multidisciplinary approach. History, architectural expression, structural layout, and construction of ancient buildings will be discussed in order to develop the capacity to look to archaeological remains with a deeper understanding. Roman Architecture and Engineering represent one of the most outstanding achievements of past civilizations. Their architectural expression and their building technology influenced most of Western architecture until the inception of Modernity, when technology based on the use of steel and reinforced concrete brought to new architecture and the loss of a millenary tradition. Buildings will be analyzed both for their architectural values but also as the result of a process which took advantage of the available building materials and building technology in a specific historical, political and geographical context. Traditional building techniques and structural understanding have been perfected over the centuries by means of experimentation, whose successful results were then handed down from generation to generation. 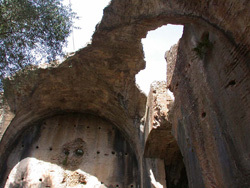 Starting from the Greek construction, based on dry masonry and the "post and lintel" structural principle, the Romans developed a revolutionary building technology, which made use of the mortared masonry and the use of arches and vaults. Nevertheless, Romans remained closely influenced by the system of decoration of Greek architecture. The course studies the archaeology and architecture of buildings in ancient Italy from the fifth century BC to the fourth century AD, adopting a multidisciplinary approach based on archeological evidence, technical and functional aspects, and historical significance. Classes are taught on location and focus on the most relevant monuments and archeological sites in central and southern Italy, including Rome, Ostia Antica, Pompeii, Herculaneum, Baia, and Paestum. The course is divided into three parts: (1) structural design and technical issues related to ancient monuments, (2) monuments of Etruscan Italy and Magna Grecia, and (3) Roman monuments. This course is a collaborative and interdisciplinary project realized in tandem by Alessandra Baroni and Donatella Stocchi-Perucchio. Its objective is threefold. The first objective is to introduce students to the history of Medieval, Renaissance, and Baroque art in the geographical, historical, artistic, and anthropological context provided by the Tuscan territory and, for the sake of comparison, by other major centers of Italian art like Rome and Venice. The second objective is to teach students how to analyze a work of art and recognize its iconographic tradition (e. g. the canonical attributes for the identification of the Evangelists and other Saints) or the meaning behind symbols (such as the cross); its style (the typical features of a Sienese artist versus a Florentine or a Venetian one); its materiality (the artistic techniques and the materials employed), and its multiple functions and uses (e. g. jewelry, reliquaries, stained glass windows etc.). The city of Arezzo, with its wealth of exemplary and acclaimed artistic masterpieces and landmarks—such as the reliquary of Saint Donato, Cimabue’s painted Cross, the fresco cycle by Piero della Francesca, Vasari’s private archive and house (Museo Casa Vasari)—is an ideal laboratory in which the above goals can be met by focusing on specific objects in their original locations, still performing their original function. The third objective is to show how in the Middle Ages and Renaissance, art, literature, and spirituality intersect and interact with one another. The figure who best represents medieval spirituality and one who sets in motion a new development in both figurative arts and vernacular literature is Saint Francis of Assisi. For this reason, the Saint and the order he founded have a central role in our course as a nodal point of connection between the part led by Alessandra Baroni and the one led by Donatella Stocchi-Perucchio. In the unit on Dante, Boccaccio, and the Aretine territory, we study Saint Francis in the Divine Comedy and we put him in his territorial context the way Dante did. A privileged place for our purpose is La Verna, the first Franciscan sanctuary founded by Francis himself in 1216, and fundamental center for Renaissance art. Here Andrea Della Robbia and his followers were appointed between the XV and the XVI century to make sixteen glazed terracotta sculptures whose technique, colors, and subjects perfectly represent Franciscan theology and spirituality. Continuing with Dante as our guide, this part of the course focuses on some fundamental moments of the political history of Florence and Arezzo such as the war between Guelphs and Ghibellines that Dante experienced as a protagonist and depicted as a poet-narrator. Once again this implies visits to historical locations whose relevance is both artistic and literary such as the Cathedral of Arezzo and the castles of the Counts Guidi of Poppi and Romena in the Casentino Valley. The castle of Poppi, in which Dante was hosted during his exile and wrote a portion of his Comedy, houses the Rilliana Library with its extraordinary collection of illuminated medieval manuscripts, incunabula, and old masters’ prints. Tying literature, history and art—in this case the art of illumination and printing—the instructors address here the theme of the transmission of ancient culture through the manuscripts. A final, short portion of the course takes into consideration the Decameron by Giovanni Boccaccio, another great Trecentista and vernacular narrator connected to our territory, whose work, as much as Dante’s, nourished a vast iconographic tradition. We conclude the course by discussing Botticelli’s depiction of the banquet of Nastagio degli Onesti (Decameron V,viii), and his famous illustrations of the Divine Comedy. Albert Maysles, a founding father of American Direct Cinema, maintained that making documentary films is a way of helping to create a better world. According to Maysles, documentary allows people of different cultures to come to know one another on a deeper level and helps to avoid misunderstanding that often degenerates in conflict, intolerance and violence. Today, thanks to the digital revolution, filming is widely available (many successful documentaries have been produced with nothing more than a simple smart phone). The abundance of technology, however, is not enough to guarantee successful outcomes. Most casual video making is often of little value and usually of interest only to the people directly involved with it. Acquiring a basic grammar of documentary filmmaking can make the difference. The English 19th Century art critic John Ruskin would say that only when one sketches an artwork does he or she really see and understand it. Today we can substitute a video camera for the pencil and notepad. Creating a documentary film will enable the students to see and understand Italy and its culture in a unique way. The course aims to introduce students to the history of the documentary film and to some major issues in intercultural communication as well as offer hands-on experience in documentary film production. In the historical survey of the special emphasis will be given to Italian documentaries; this will enable the students to become acquainted with certain aspect of contemporary Italy as they have been represented by documentary filmmakers. In the production segment of the course the UR students will work together with a group of Italian students attending my Digital Media Studies course at the University of Siena - Arezzo campus. The UR students will be engaged in producing short documentaries on some aspects of the culture surrounding them, such as the Aretine antiques fair, or the worshiping of the Madonna del Conforto, as seen from the point of view of a foreigner visiting the city. Throughout the three phases of documentary filmmaking (pre-production, production, and post-production) a strong interaction between the foreign and the local students will be encouraged, during which the intercultural communication process will be strengthened. At the end of the semester there will be a final general screening of the films created both by the UR and the University of Siena students. The documentary filmmaking technique which the students will be adopting is inspired by American Direct Cinema, which believed in a non-invasive, minimalistic, observational approach to filming: no extra lights, no tripods, small unobtrusive cameras, no re-enactments. For this reason students are encouraged to bring their own equipment, which can be as minimalist as a smartphone. The final editing will be done on locally available Macs and Final Cut Pro software, though the students may use their own computers and software if they prefer. “Il corso intende portare lo studente a contatto con la lingua vera, quando possibile attraverso materiali autentici; arricchire il lessico; far riflettere sulla lingua leggendo ed ascoltando in modo attivo con la guida dell’insegnante; presentare aspetti della cultura italiana. Comprehension: students will gain understanding of oral and written material on a variety of topics, ranging from standard phrases (questions, commands, and courtesy formulae) to include increasingly elaborate topics such as personal routine, taste and hobbies, family, fashion and cinema. Students will be able to acquire key information in the listening and reading of authentic material describing present and past events, presented clearly and supported by pertinent vocabulary. Their understanding will grow to include standard Italian conversations, presented in a clearly audible (and occasionally slowed) speech, in a variety of familiar subjects. Production and interaction: students will be able to engage in conversations on a variety of real-life situations regarding familiar subjects, to respond to open-ended questions and initiate communication on these topics. They will be able to give and follow directions, instructions and commands. Students will be able to debate in small groups on a specific topic. Skills in mono-directional oral presentation will also increase. Writing skills will focus on both present and past events, personal experiences, school and work situations, as well as brief messages. Linguistic structures: subject and object pronouns, articles, adjectives, present indicative and imperative, irregular and reflexive verbs. The passato prossimo and imperfetto, passato remoto, trapassato remoto and trapassato remoto as well as future semplice and future anteriore tenses will be covered, allowing students to expand their grammatical knowledge acquired in their previous studies. The teaching method used is based on a communicative approach. You will be working in groups, pairs and individually. Learning is based on co-operation with fellow students. Classes will be conducted in Italian in order to help students think and react in Italian. Living and studying for a semester in a foreign country, in a foreign language, far from the comforts and services of the home campus can prove to be remarkably challenging to the undergraduate student. Without active cultural mediation, a student may find themself feeling alienated in an unfamiliar setting. That feeling can influence and hinder the students’ abilities to understand their host culture and reap the benefits of their study abroad experience. This 2-credit course aims at guiding the student through the differences of life in a small, Tuscan city from that at the UR campus. Pre-program activities and reading assignments are made two-months prior to arriving in Italy in preparation of each individual ‘journey.’ Students are encouraged to keep journals and are required to attend regularly scheduled meetings as well as travel together to places of interest. These afford opportunities to share experiences that form integral elements in our on-going discussions on cultural differences. An initial focus on non-verbal cultural cues that are dissimilar to those in the US is followed and developed into learning how to travel and visit cultural centers as the educated traveller and not the consuming tourist. This course starts with a brief introduction of the contemporary Italian economy and the economic role of Italy in the European Union. Afterwards, the course transitions to the discussion of concepts related to international management and their application in real-world cases of Italian companies with international operations. Students will complete weekly reflection memos and a final group project paper. (4 credits), Instructor: Andrea Rinnovati, M.D. The differences in the approach to health care in Europe, and in particular in Italy, as compared to health care in the US are many. Similar to the differentiation in US health care from one state to another, the same is true in Italy where organizational and legislative variances exist among the various regions. However, the dissimilarities are more formal than substantial. We will proceed with the analysis of the health care system in the Region of Tuscany that starts with the active promotion of wellness which, among other factors, appears to be one of the reasons for the longevity of these complex social structures. Environment and health as defined by the WHO includes both pathological effects deriving directly from chemical, physical and biological agents as well as the indirect effects on health and wellbeing caused by physical, psychological, and social environs. The latter includes housing, urban development, the workplace, the use of the territory and transport. On the European level this definition is extended to the effects on the environment and health caused by climatic changes. Hence, it is a broad definition that requires an integrated approach for the understanding and the elaboration of innovative policies. Some points should be underlined as having particular impact. Optimization of economic resources of the Regional Health System used specifically for categories at high risk, and care for the regional population on the whole. An analysis of the health of the general population clearly underlines the urgent need to develop means of prevention, in particular those aimed at chronic illnesses to contain their effects. Comprehensive action aimed at reducing risk factors through early diagnosis and prevention of complications is of paramount importance. The breadth of topics regarding the structure of the regional health care system to be covered will also include pediatric and women’s health care, organ transplants, diagnosis, palliative care and hospice. Study-related site visits: Students will travel to Siena to visit one of the oldest medical institutions in Tuscany, Santa Maria della Scala, as well as to Florence to visit both the ‘Ospedali degli Innocenti’ and the hospital Santa Maria Nuova, founded in the 13th century by the father of Dante Alighieri’s beloved Beatrice. (4 credits), Instructor: Stefano Tenti M.D. Objectives: Health care costs around the globe are quickly reaching levels that are unsustainable. What can we learn from reviewing the forms of health care in the past? What is the approach of public and private health care in Italy? What are the goals in optimal health care that the Centro Chirurgico Toscano aims to reach? These and other questions are what we propose to discuss in a course on health care in Italy. Class topics: Public healthcare systems: The ‘Bismarck’ healthcare model – History and implementation (where). Public healthcare systems – Universal systems – the “Beveridge” model – History and implementation (where). Private healthcare systems – “Obama care” and similar models – History and implementation in the USA. Private healthcare systems – “Charitable” models – History and implementation (where). Opportunities offered within public systems: Personal health care intended as an asset for the community. Economic advantages for the community derived from health expenditures that are paid by public institutions. Economic unfeasibility of a guaranteed universal health care. Criteria for the choice of treatments that must be guaranteed. The Centro Chirurgico Toscano’s stance in reference to the previously stated issues. Perspectives of the future of health care in western society. How can a sustainable model be defined? COURSE ORGANIZATION: The program will be carried out directly at the Centro Chirurgico Toscano under the guidance of Dr. Stefano Tenti, director of the center. Frontal lessons will be followed by study groups that examine the topics as implemented by the center itself. Field trips will include a detailed visit of the Centro Chirurgico Toscano, the Poggio del Sole clinic and the Sapra center, as well as the public hospital in Arezzo. The goal of this course is to understand how social media have become an extremely powerful marketing tool in the last decade and how companies and organizations use social media for strategic benefits. Guiding questions include: To what end/for what purposes are organizations using social media, how organizations may realize the benefit/ROI from using social media, what are the parameters for ‘success’ in such campaigns, the (theoretical and pragmatic) differences among various social media, what motivates audiences to participate and interact with brands, and how organizations might invite such identifications? The rise of social media: How social media has changed the way of selling and doing marketing. Basics of social media campaigns. Defining goals, customer personas, and ROI. What kind of campaign do you want to run? Commercial, political or a campaign for social change? Analytics: why are they so important and what can they tell us? Crisis Communication and digital reputation management. Handle social media with caution! How social media can built or destroy your reputation. influencers marketing: The power of influencers and ambassadors in social media marketing.